“The SDLP will continue to fight against the decision by the coalition Government in London to privatise Royal Mail and have put forward a motion in the Assembly this week to register our opposition. I will be working with my colleagues to ensure that Westminster is aware of the potential negative impact on Down District.” Cllr Gareth Sharvin. “In bringing forward this motion, the SDLP wanted to register the Assembly’s opposition to the unilateral decision by the Coalition Government in London to privatise Royal Mail,” said Down District Council Councillor Gareth Sharvin. 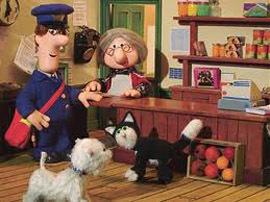 Has Postman Pat a future if rural post offices are closed? “Royal Mail is a vital public service and we are indebted to the hard-working men and women who have made it the success it is today. In 2012/13 Royal Mail the operating profit was up from £152 million to £403 million – a profit margin increase from 1.7% to 4.4% on the previous year. Councillor Sharvin added that post offices are the hubs of communities in many parts of the country, and in rural areas often no-one else is in a position to provide that service. He said it is in rural communities that the impact of this politically-motivated fire-sale of Royal Mail will be hardest felt. “No rural representative can be convinced that the separation of the Post Office from Royal Mail will protect rural Post Offices from the pressures on the universal service obligation that privatisation will bring. “There is no guarantee that the current agreement between Royal Mail and the Post Office will continue in 5 years’ time, never mind remaining unchanged at the end of 10 years. Breaking that link will devastate the Post Office Network and condemn many rural post offices. “The new regulator, Ofcom, will be effectively powerless when a privatised Royal Mail, facing understandable commercial pressure from its competitors, brings forward proposals to alter the terms of the six-days-a-week, one-price-goes-anywhere Universal Service Obligation. “We do not oppose the on-going modernisation of Royal Mail. Indeed it is important that it is able to adapt to changing conditions and emerging technologies. However we cannot accept that this ideologically driven privatisation is not the only option available to the Government. “Accessing capital for investment in Royal Mail’s future does not have to be at the expense of selling off a vital Public Service for the benefit of private investors. Other public bodies are authorised to access private capital without affecting Government borrowing. “It should not be beyond the British Government’s ability find other ways in which Royal Mail could get access to capital without privatisation – and certainly not a privatisation that undervalues that Public Service to the tune of £1Billion. Who will profit from that undervaluation? Not the public and certainly not the staff. “The case for privatisation has not been well made. There is a compelling case for retaining Royal Mail in public ownership and ensuring that it continues to flourish. “That would give the taxpayer a continued direct interest in the maintenance of universal postal services; safeguarding the vital link that the Royal Mail has with the Post Office; and would allow the taxpayer to share in the benefit of that modernisation and future increased profits. “I have already raised the concerns of local residents with my colleagues in Stormont and Westminster, to ensure your voice is being heard,” added Councillor Sharvin.